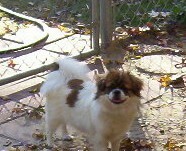 Introducing you to our VERY SPECIAL Tibetan Spaniels also "affectionately" know as "Tibetan Prayer Dogs". All of these dogs are our treasured house "pets" and full time entertainment!! These VERY SPECIAL tibbies represent the VERY BEST of United States and European bloodlines. 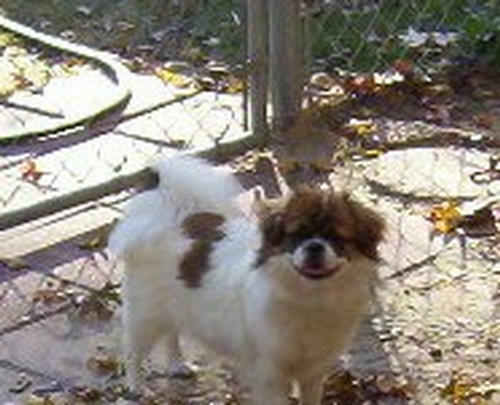 We appreciate the efforts and dedication of the foundation breeders of the Tibetan Spaniel and will dedicate our show/breeding program to safeguard the breed type of the "Tibetan Prayer Dog". One of the "most beautiful" parti's girls in the United States!!! Top Top Champion Pedigree (the VERY BEST) has whelped three gorgeous "Parti" boys sired by the spectacular AKC CH. Whatta Wisler's Boy I Am "LeStat". "LeStat" is now starting his "Specials" career on the West Coast!!! 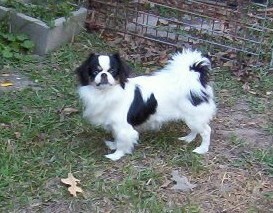 WHATTA WISLER'S CHYNA DOLL "CHYNA"
Our gorgeous exotic "CHYNA" is a full sister to Whatta Wisler's Hurricane Parti and the dam of our new AKC CH. Whatta Wisler's Lord Of The Rings "Lourdes"!! FLASH: AKC 4 Point Major, Best Of Winners and BEST of BREED over #2 Tibbie (First Time In Show Ring). NOW he is new AKC CH. 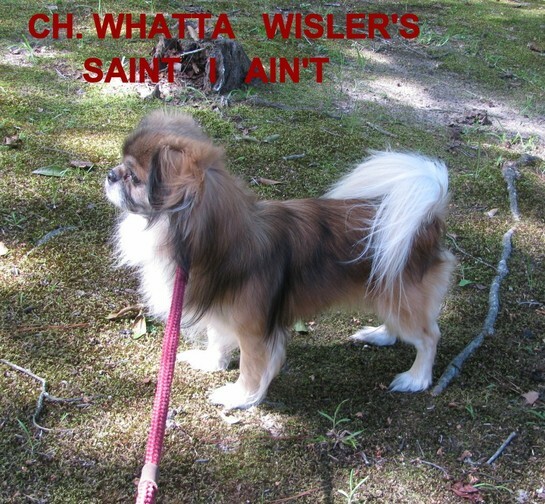 Whatta Wisler's Saint I Ain't "Saint"!!!! WHATTA WISLER'S SAINT I AIN'T This HANDSOME boy is a SPECTACULAR "Specials Quality" Show Male!!! He has one of the most magnificant head pieces around plus correct conformation, clean moving "front and rear" and that fantastic SHOW DOG ATTITUDE!! This boy is literally "DROP DEAD GORGEOUS"!!! Special Thanks to Breeder Judge Diane Nachman for the 4 Point Major win, Best of Winners and Best of Breed (over Top Specials) his VERY FIRST show OWNER HANDLED!!!!!!! WHAT A THRILL!!!!!!!!!!! FLASH!! NEW AKC CHAMPION WHATTA WISLER'S SAINT I AIN'T "SAINT"!! He finished on the tough Florida circuit with a FIVE Point MAJOR and BEST of BREED over SEVEN Top Champions!! !